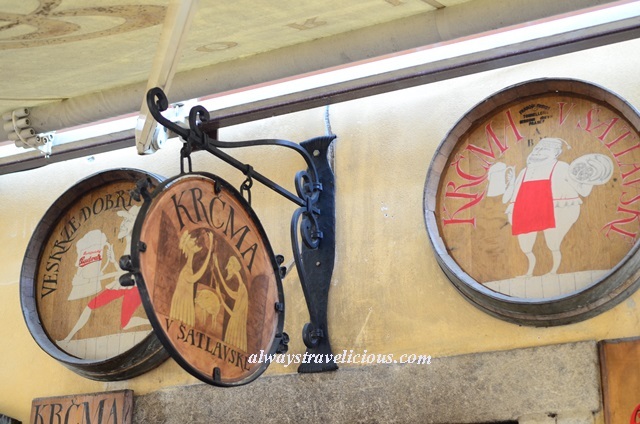 Krcma v Satlavske @ Cesky Krumlov, Czech Republic - Always Travelicious ! Krcma v Satlavaske, or Tavern on Satlavaske Street in Cesky Krumlov is where we had one of the best meals during our time in Europe. 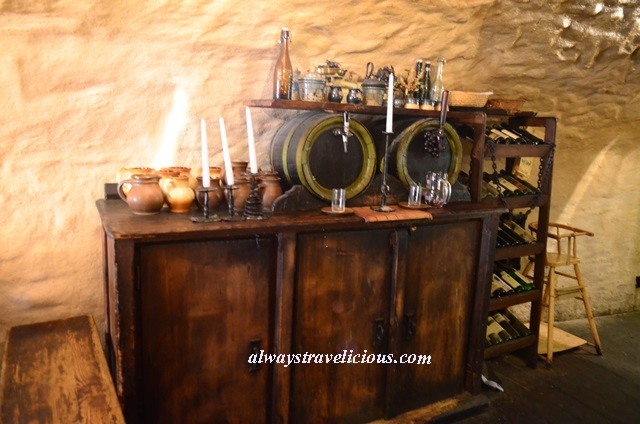 The restaurant is set up in a stony, narrow dungeon with a low ceiling, exuding an ancient aura, mimicking an unique medieval dining experience. while dim lighting and flickering candles and a sense of mystery. To start off the meal, we had mead, or honey wine. 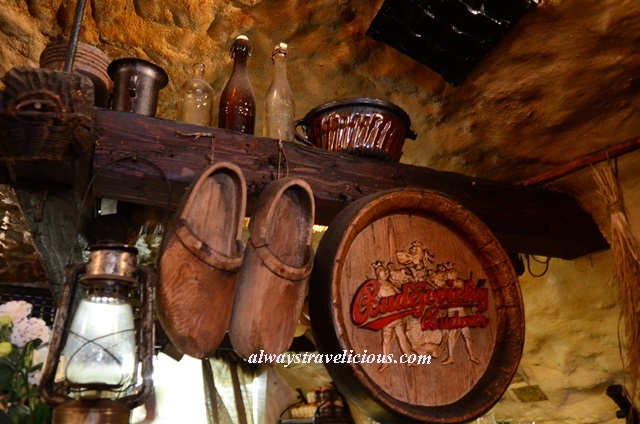 Mead is a popular drink in Cesky Krumlov and the flavors from different restaurant can vary drastically. The mead from Krcma v Satlavske is warm without any spices. The punch from the alcohol is light and it is the sweetest amongst a few I’ve tried, tasting quite similar to dessert wine. The pork knuckle here is AMAZING ! It even beats the ones we’ve tried in Germany, the land of all things pork. It’s an enormous piece sufficient for sharing for two and it’s just under 10 Euros ! 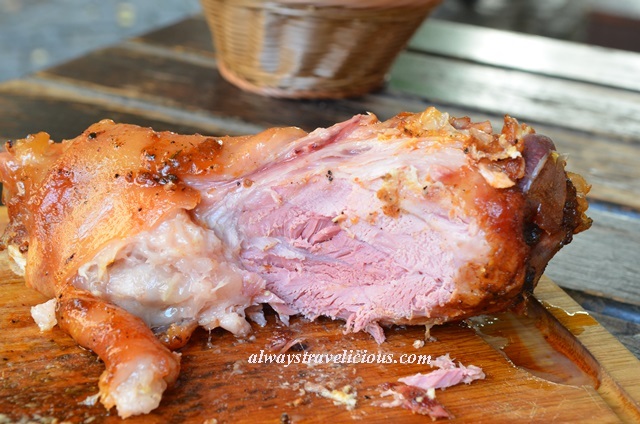 The pork knuckle has a superb crisp skin with basic seasoning of salt, black pepper and a bit of herbs. It came with purple sauerkraut, mustard (the smooth suace on the left bottom corner) and the textured white horseradish next to it. I like the pork knuckle the best when paired with the fresh horseradish, which has a similar punch and texture to freshly ground wasabi. The skin layer is usually the fattest part of the pork knuckle, but surprisingly this one is hardly oily. The meat is cured with just the right amount of salt to give it a beautiful pink hue without being harshyly salty. We didn’t see our pork knuckle being grilled on the open fire grill as we were sitting outside, but the grill is one fine piece of beauty, adjoined to the ceiling with heavy-duty metal grill pans. I did catch a bunch of other meats sizzling in action, where an alluring aroma of barbecue permeates the air. 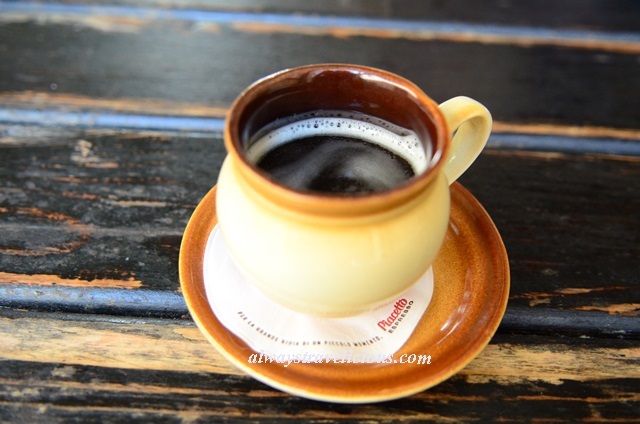 Just in case you don’t want to get that same aroma on your clothing, the tavern has an outdoor terrace seating area, decorated with paintings on wooden panels, with bunch of happily feasting people the subject of painting. As for service, we had interacted with various staffs at the restaurant and found that the male staffs were the ones that were totally affable, patient while the female staffs were not too passionate and even a bit sulky. The restaurant is very popular and I would recommend to make a reservation before going. The only reason that we got a table was because we were there early at 5 pm and by then most of the tables already had a “reserved” on them. Opening Hours : Daily 11 am – 12 pm. To be honest, I had not even considered visiting Eastern Europe but your travel series with a particular focus on dining is amazing, KJ. As for this cave/ porky heaven – you had me at that knuckle!